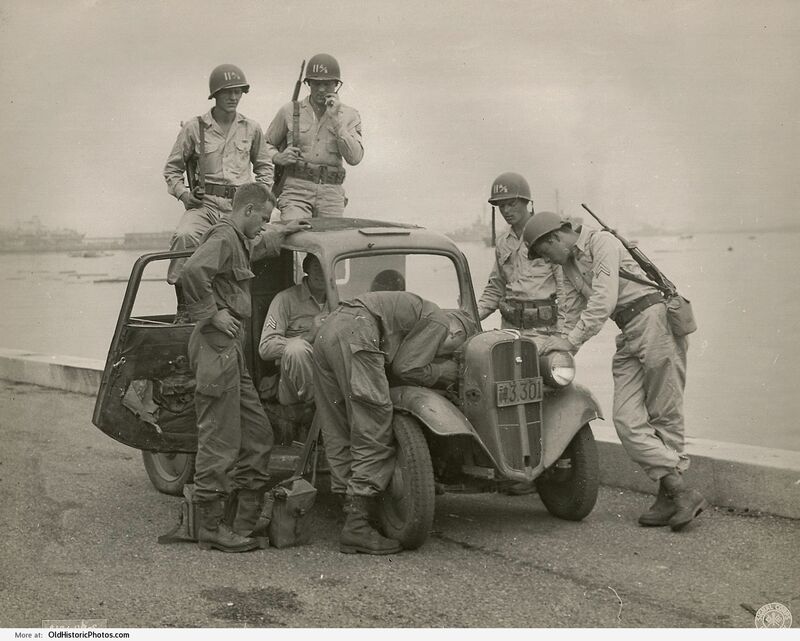 While some of the troopers continued to await the arrival of the good ole’ American jeeps to replace the coal-burning vehicles in Japan, General Swing was striving to make the occupation as bearable as possible. They had endured some horrendous hardships and accomplished more than anyone expected from them and he felt they deserved whatever he could provide. 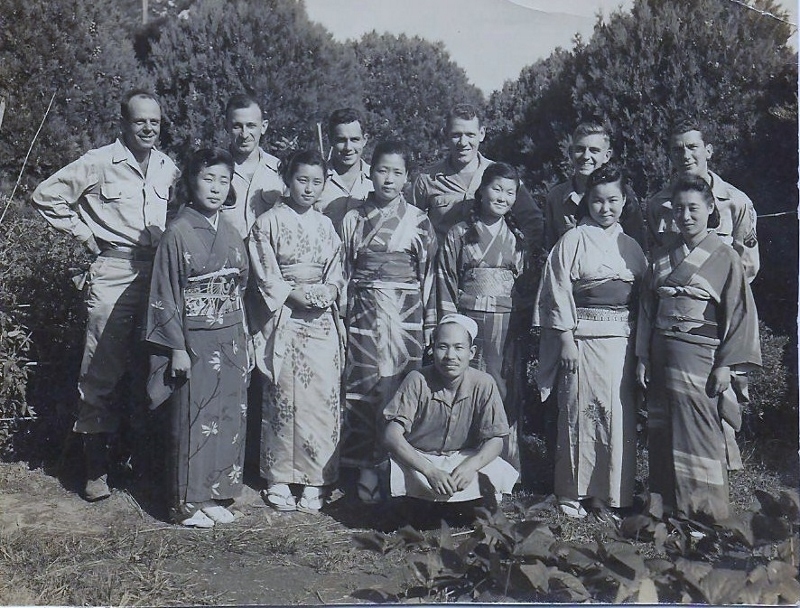 On his orders, a Japanese auditorium was transformed into the 11th Airborne Coliseum. The complex was large enough to hold a theater that would seat 2,500, four basketball courts, a poolroom with 100 tables, a boxing arena that held 4,000 spectators, six bowling alleys and a training room. Aside from the sports theme, the coliseum contained a Special Services office, a snack bar, a Red Cross office and a library. I can just picture my father spending some off-duty time in the poolroom or bowling alley. When I was growing up, we had a pool table in the basement and Smitty would teach me how every shot was related to angles and geometry. My aim improved – once I figured it out. 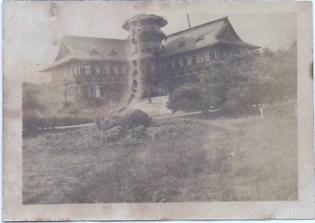 On the reverse side of the photo seen above, Smitty wrote, “This is the hotel where we are now staying. That dot in the driveway is me.” The 11th A/B commander had made his home here on 16 September. 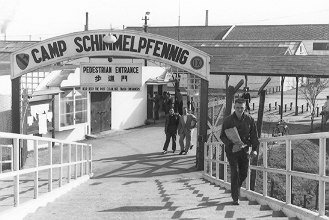 After the occupation, it re-opened for business as a hotel, but unfortunately was destroyed by fire on 2 March 1969. I have to maintain on January 31, 1945, as this is where the actions of Smitty and the 11th Airborne Division become quite confusing. While the 221st medical is attached to the 187th, the 187th itself is split and send in alternate directions. Up until now, the division has been maintained fairly well in secret from the Japanese, but it is here that Gen. Eichelberger not only wants to allow the enemy knowledge of their existence, he wants to (in his words) pull a “monumental bluff” and splash the landing across the newspapers. 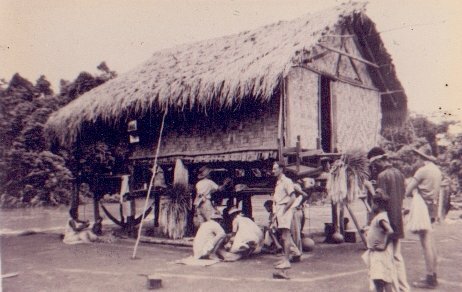 The men hit the beach with only their necessities on their backs; their personal items would not be seen for two months. 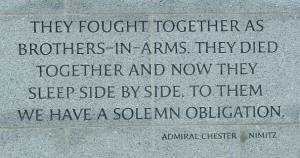 The Eichelberger/Swing strategy began at dawn with the convoy’s arrival at the shore. 0700 hours – eighteen A-20’s and nine P-38s strafed the beaches. 0715 hours – the navy began to shell the landing area with rockets from the LCIs and shells from the destroyers. 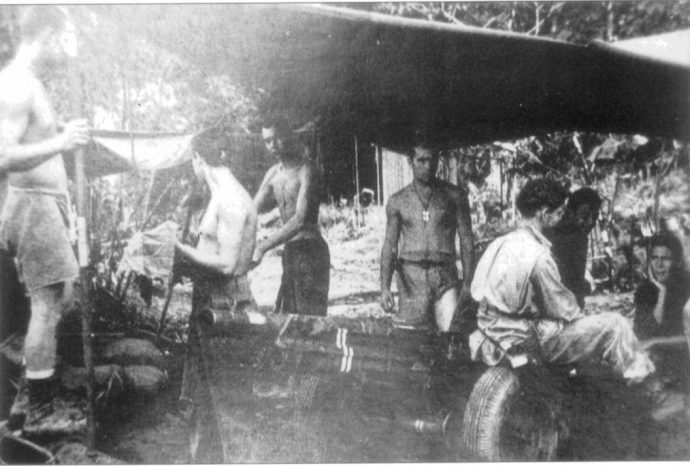 0822 – no opposition from enemy reported; first wave of 8 LCVPs lands, men head toward Nasugbu only 1500 yards away. 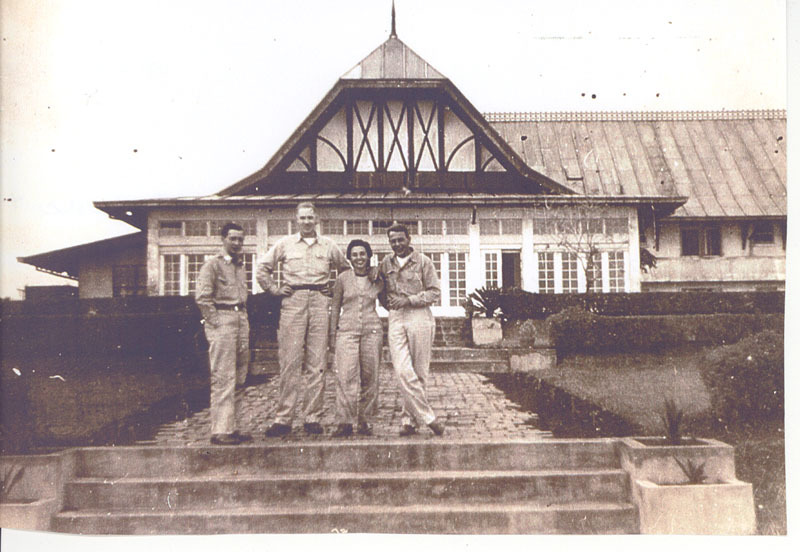 0945 – the 188th was through Wawa, Nasugbu and the airstrip. 1030 – the 187th begins landing and immediately joined up with the others to head up to Tagatay Ridge. One unit of the 187th remains to defend Nasugbu, one battery of the 674th assists. The 102d AAA AW Battalion and the 152d AA-AT Battalion set up antiaircraft defense on the beach. 1400 – Gen. Swing notified Admiral Fechteler that all the men were ashore and he would resume command. Little did the 11th know that for a few brief hours, they were under the command of a naval admiral! 1430 – all key elements were 8 miles from the beach and at the Palico Bridge. It was saved just as a squad of Japanese were about to blow the steel and wood structure. 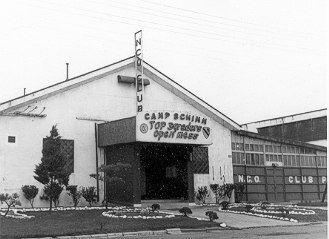 1600 – the 188th set up a CP in the Palico barracks. All companies continued to moved forward. Artillery, rifle and machine gun fire erupted shortly afterward. 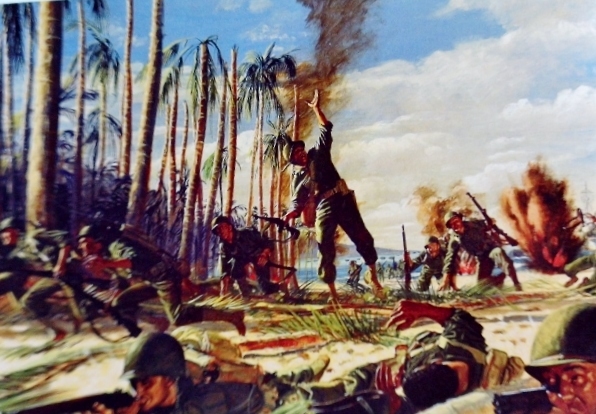 The monumental bluff was created by: a flying boatload of correspondents that blasted the news that the “Eighth Army had landed on Luzon,” and Eichelberger ordered Swing to have the 187th and 188th move as quickly as possible, fire as much artillery and weapons and create as much dust as possible. All vehicles raced down the dirt roads, guns blazing and air strikes thrown in made the division appear to not only be of immense size, but that they also had an armored unit with them. They would now be coming up on the infamous Genko Line; a stretch of blockhouses and pillboxes that contained guns from Japanese warships, 20mm, 6 inch, etc. The enemy had dug massive octopus traps called takotsubo. All this needed to be destroyed before liberation of Manila and elimination of the 20,000 soldiers waiting for them within the city limits. For this action, the 11th would be granted the Presidential Unit Citation. The 187th went down the steep southern slope of Tagatay and progressed to the north shore of Lake Taal where they were ordered to take Tanauan. The 127th Engineers carved out a road on the vertical cliffs for them. For more current WWII news – According to The Week magazine: A World War II veteran was able to hear a symphony he wrote 67 years ago, for the first time, when the U.S. Army Orchestra premiered it in Washington D.C. Retired Colonel Harold Van Heuvelen, 93, was inspired by his experiences as a soldier to write the symphony in 1945. When his son found the music, he launched a campaign to have the Army play it. The composition drew rapturous applause and a standing ovation for the composer. Also – When Joshua Neldorf celebrated his bar mitzvah in Sept. he decided to donate $13,000 (most of his gifts) to Operation Mend which provides medical services to American soldiers with facial injuries. His generosity was inspired by a family friend, Sgt. Louis Dahlman who was injured by a roadside bomb in Iraq in 2007. Locally – south of me, submerged in 240 feet of water, a World War II Navy F6F Hellcat was located off of Miami Beach. 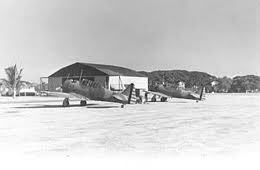 Florida was used for training Navy and Marine pilots during that war. Since the nearly intact wreckage is embedded in the sand and upside-down, it is not known if the pilot is buried with his plane. 21 January 1945, General Swing announced to his force that he was ordering a division review. 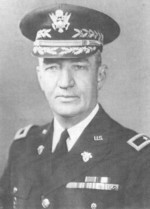 The 11th Airborne Division was being transferred to the command of the Eight Army and the reviewing officer was would be none other than General Eichelberger, the top commander, himself. 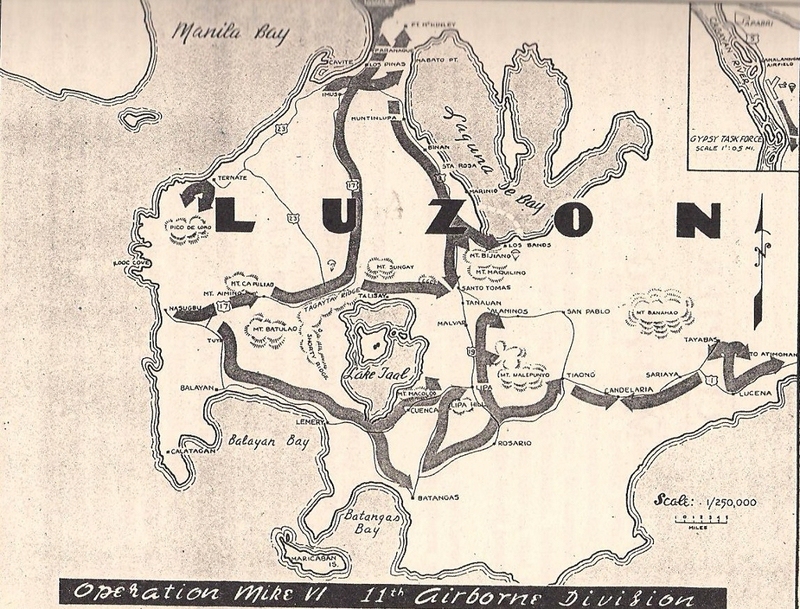 Field Order Number 17 informed Swing that the 11th A/B must pack up and move on to the island of Luzon, P.I. 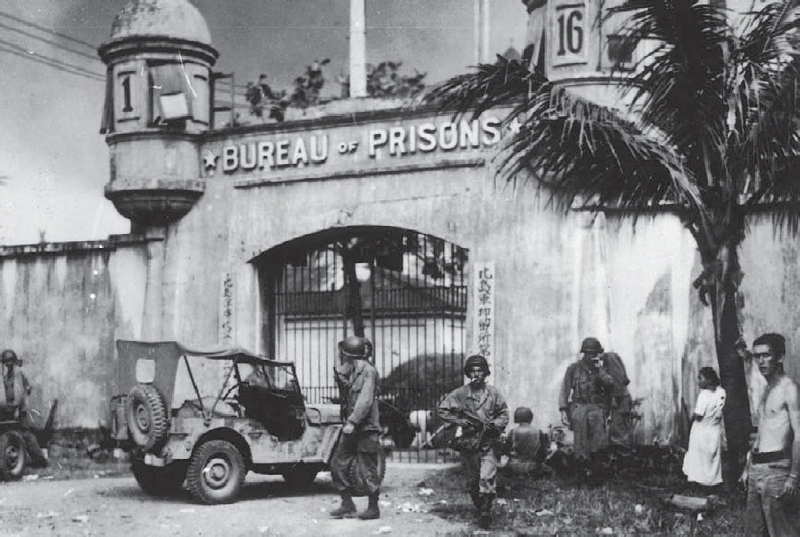 Upon arrival they would be expected to retake Manila, destroy the Japanese Genko Line of defense and release all internees being held captive at the prisons, especially Los Banos. 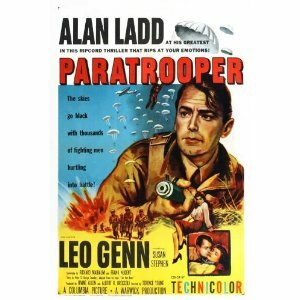 War or no war – Hollywood would continue to be Hollywood. Gloria Vanderbilt had separated from her husband of two years, Pat deCicco, two months before she was to inherit $4.5 million. Ida Lupino filed for divoece from her husband, Louis Haywood. Obviously, the rich and famous were having a rough time of it during the war. Then, you have the opposite spectrum. One of many, many examples being – Rod Serling, best known for his televisions shows, “Twilight Zone” and “Night Gallery,” was a Pvt. in the 11th A/B and would earn a Bronze Star. 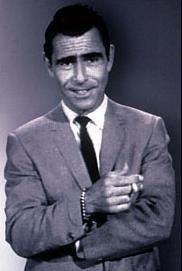 Rod Serling – formerly 11th A/B Div. 24 January, General Swing issued Field Order Number 10 that specifically outlined their orders. 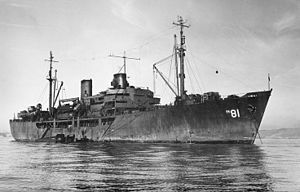 To accomplish their task, 120 ships and landing craft would be used to transport the troops, equipment, ammo and replacements for the division up northward approximately 400 miles. They were now numbered 8,200 men, about six thousand short of a normal division. 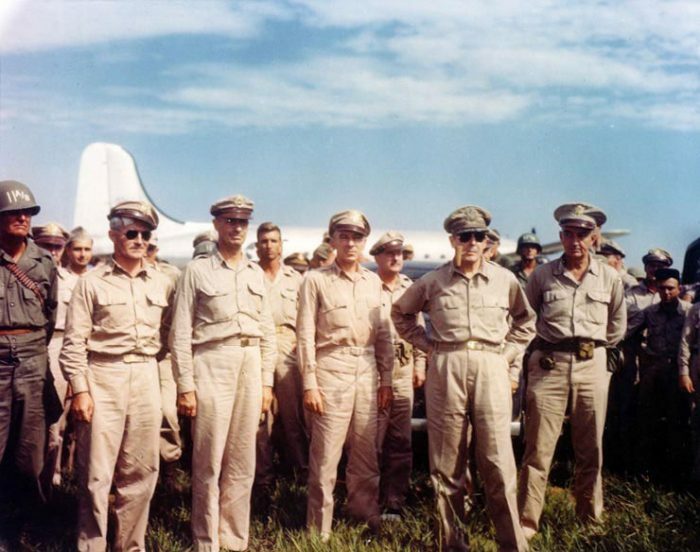 Personal note – As people remember Pearl Harbor and honor those that gave their lives, please bear in mind that December 10 thru 13, the Japanese 16th Division went ashore at Lamon Bay, Luzon, P.I., stormed across the island to Tiaong and then headed for the capital, Manila. 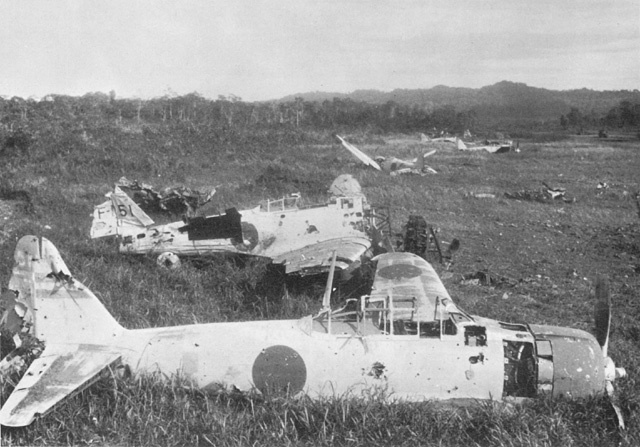 The Japanese took total air superiority almost immediately. 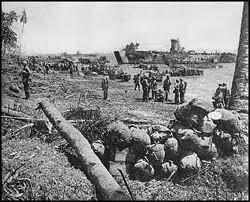 The American and Filipino troops became encircled and the end result would be the Bataan Death March. I will have further information as I bring the U.S. troops into Luzon. Please remember that if any photograph is too small for you to make out clearly, simple click the photo to enlarge. Yesterday, being Sunday, a day of rest, I decided to ride around this place and see something. I made up my mine though that this sightseeing tour of mine, this time, would be done as a civilian completely forgetting I’m in the army. You have to do this in order to see the place in its true light, otherwise if you don’t all you can see is hardship and work. With my mind cleared of Khaki, I set forth in a jeep with a buddy of mine; who I dare say couldn’t see the sense of our venture. As we drove along in the still quiet, the thought kept coming to me of the enormous job the boys before us had to confront and overcome. Here and there along the way you could see some old emplacement or deserted village. These villages were really something to see with their straw-thatched roofs and open sided houses. We wouldn’t call them shed, but that is just what they looked like. One can readily understand why the authors of those travelogues really go all out when describing these islands. You forget the heat as cooling breezes blow over you from the coast and the shade of the giant coconut trees gradually engulf you. We passed one spot close to the coast that suddenly shook us with the horrible realization of our place and mission. It wasn’t large or spread out, but all was peaceful and quiet though men were gaily chatting and swimming nearby. We entered by an archway on which was inscribed, “Japanese Cemetery.” We passed now upon some of the little white markers all neatly lined up and lettered. 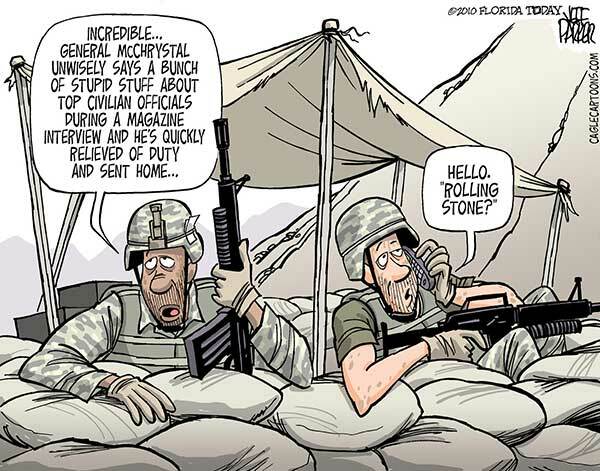 Although they were once an active enemy, one could not help but see the shame and waste of war. We looked around the beach for a while, then decided to go in for a swim. The water here is amazingly warm and clear. You could never believe it unless you could see it as I have. How crystal clear and immune of blemish this water here is. Why, to peer down 25 feet and see bottom is really an easy thing to do. The bottom is sand, sand at its finest and whitest literally covered with shells of every shape and color with here and there a grotesque piece of coral. You can really pick out the coral as it shows up a faint green while the shells throw all colors of the rainbow up at you until your eyes are completely dazzled by the many-colored lights. By this time, the sun was well on its way toward the horizon and dusk rapidly approaching. Here and there a faint star twinkled until suddenly the sky was almost completely covered with thousands. The moon finally appeared in all its bright glory and reflected itself a hundred times over on the waves before us. The end of the day had come and with it also my venture into a world never to be forgotten. This day will long be remembered and stored with the rest of my most treasured memories. PS. I shall write to Joe Dumb as soon as I send this letter on its way. Be good and take care of yourself. It was after this one month later after this report that the specialized training for the 11th A/B began and the War Dept. 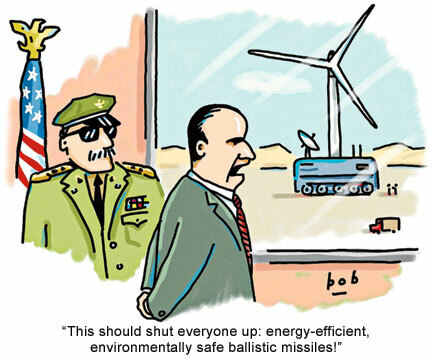 also saw the need for improved weapons for this “new type of war.” Under the direction of Colonel William Borden this effort resulted in: 105-mm and 155-mm mortars, flamethrowers, ground rockets, colored smoke grenades and the skidpans for towing heavy srtillery in muddy terrains.